Eric Kayser – The famous baker who has stores throughout the city (and now abroad) has developed a line of gluten-free bread, pastries, cookies and cakes that are all labeled “libre gluten” at his 4 rue de l’Echelle, 75001 location. The selection is limited and prices are higher, but it’s well worth it for those with serious allergies. Kayser took cross-contamination concerns very seriously and created a specific gluten-free lab/bakery to avoid traces of other flours, hired a baker with celiac’s disease, and wraps the bags in two plastic bags to ensure that they’re safe when in the retail location around other wheat products. Café Marlette – This sweet & stylish café near Pigalle has healthy soups & salads that are often naturally gluten-free, but the real appeal here is the baked goods. Many of their cakes use rice or buckwheat flours, and they have boxed mixes available for home baking. Options include banana bread, fondant au chocolat, a rapadura sugar cake and more. Their mixes can also be found at gourmet food shops like Maison Plisson and La Grande Epicerie. Bob’s Bake Shop – Bob’s is worth the trek for the (very good) bottomless cups of coffee for 2 euros alone. There’s always a salad or two, a maki roll, and a soup that are good for the gluten-free, but they usually have a satisfying GF sweet or two. We’ve seen gluten-free vegan fruit crumbles on most days, plus nutty macaroons (not macarons) and an excellent moist chocolate-pear loaf cake on occasion. Helmut Newcake – Classic French tarts & sweets at this dedicated gluten-free café & bakery near the Canal Saint Martin. Noglu – The first dedicated gluten-free restaurant in Paris with a small grocery and a separate location for take-away. Bears & Raccoons – A brand new, entirely GF sandwich shop. Café Pinson – A (surprisingly?) trendy vegan café in the Marais that is sensitive to gluten issues. Their health-conscious soups and salads are often naturally gluten-free and you can usually find a few GF sweets to finish. Nous – A casual restaurant serving GF rice bowls, salads, soups, fries, and sweets. They now have a second location near Châteaudun. Le Grenier de Félix – This award-winning boulangerie in the 15th has gluten-free bread available upon special order. Ob-La-Di – This coffee shop in the Haut Marais has an excellent gluten-free granola mix, and a handful of baked goods that somehow manage to be good gluten-free, and vegan, and actually taste good. My Free Kitchen – Gluten-free, dairy-free, and all-organic café. L’Atelier des Lilas – A wholesale producer of well-regarded lactose free & gluten-free quiches, tarts, cakes and cookies. Their products are available at a wide range of grocery stores and shops. Le Pain Quotidien – It’s an international baked goods behemoth, but they’re always good for gluten-free breakfast & lunch in a pinch. Grom – The international chain of gelaterias has gone entirely gluten-free, so even the cones are fine to eat. There are a variety of natural and organic food stores like Naturalia, Bio C’Bon, and Pimlico which have extensive selections of gluten-free goods. Even regular grocery stores like Franprix or Carrefour are getting into the act and you can often find a dedicated aisle for special diets including gluten-free items. Blé Sucré – This excellent bakery is filled (as the name implies) with wheat, but they almost always offer an individual chocolate-raspberry trousseau cake made from almond flour that is naturally gluten-free, plus homemade macarons stuffed with whipped cream and jam. Crêperie Mad Eo – Many of the savory galettes at this Breton crêperie are made with naturally gluten-free buckwheat flour. Pain de Sucre – This is a bakery chock full of gluten, but they have a variety of gluten-free offerings including homemade alcoholic marshmallows, cookies made with chestnut flour, calissons made from almond paste, macarons, and ice cream & gelato. Gilles Marchal – Gluten can be found in abundance at this pâtisserie in Montmartre, but the Alsatian baker makes an excellent gluten-free “Sacher” cake that is reminiscent of a rich, chocolate tiramisu. Many of the craft coffee shops in Our Guide to Decent Coffee will have a GF sweet or two to accompany drinks. Most of the Mexican restaurants in our guide utilize corn tortillas and would be mostly gluten-free. Always confirm with the chef/your server. You can order corn chips and tortillas directly from Tortilleria Mil Amores for GF Mexican at home. Bululu Arepera – Venezuelan arepas are made with cornmeal and stuffed with meats, cheeses and plantains, and are naturally gluten-free. Niépi – a French magazine devoted to the art of living without gluten. La Semaine du Sans Gluten – A weeks worth of seminars and events promoting gluten-free dining in Paris at 14 locations throughout the city. Gluten-Free in Paris – a website dedicated to discovering the best GF addresses in the city of carbs. With Love – Allergen Free – a Facebook page with resources for those in France with food allergies. Clemsansgluten – A popular French food blogger who develops gluten-free recipes. L’Association Française Des Intolérants Au Gluten – The French association for the gluten intolerant. Hi there. https://www.biosphere-cafe.com/ is also a great little gluten-free spot near the grands magasins. There is a new thai gluten free restaurant in the Passage de Panoramas right near no glu. It’s called Kapumka. The whole menu is gluten free. Als o Wild and the Moon at 55 Rue Charlot is 100% gluten free. It serves vegan whole food options and has really great food. Yay – my son and I are both coeliacs and are visiting Paris in early July – this list and the one in the comments have made me sleep at night! It’s so hard trying to eat gf when travelling and language is a barrier. I really appreciate these lists – thank you! Carla, why a joke? My 10-year-old has celiac (and speaks fluent French, he’s been in a French immersion school since he was 3, and has been to France four times). 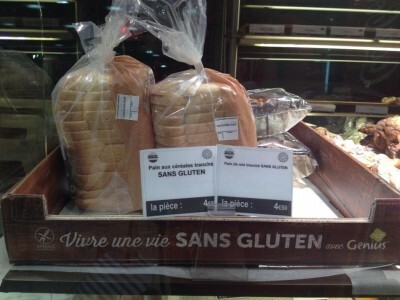 France is really tough for us as a celiac family. Awareness hasn’t been nearly what it is in Italy, and GF restaurants, cafes, and bakeries have historically been almost nonexistent. This is a wonderful resource for the approximately 1% of the population with celiac who truly, seriously, and medically cannot have gluten.